One of our very good friends just turned 30 so we attended a shin-dig hosted by his girlfriend over the weekend. The theme was “Fiesta” so I decided to bring Elderflower Sangria and a big pot of Latin Pork & Tomatillo Stew with homemade corn tortillas. Bringing a hearty stew to a party in the middle of July may seem strange, but I was happy to have something filling to soak up the booze. At less than 350 calories per serving, this stew is the perfect choice for a filling meal without the guilt. 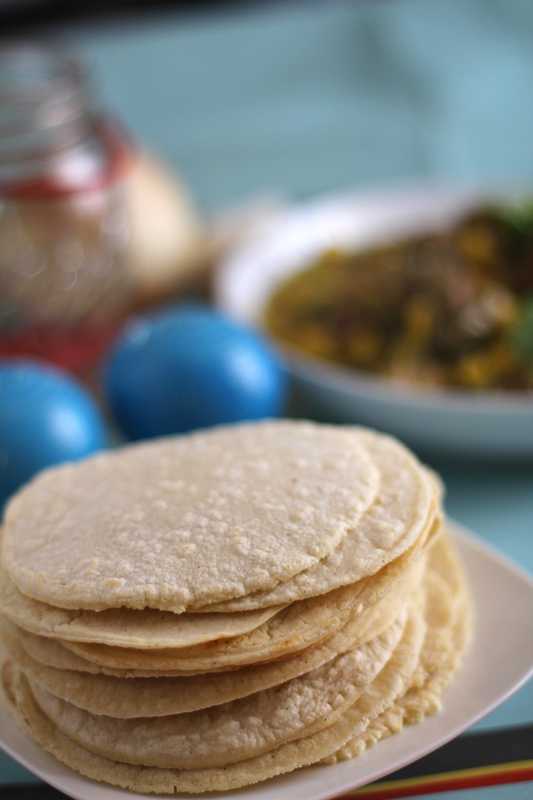 I’d highly recommend taking the 30 minutes to make the homemade tortillas, as they just bring something special to the table compared to the store-bought variety. The pork takes a little while to roast in the oven, but it is totally worth it to achieve that fork-tender fall-apart texture. 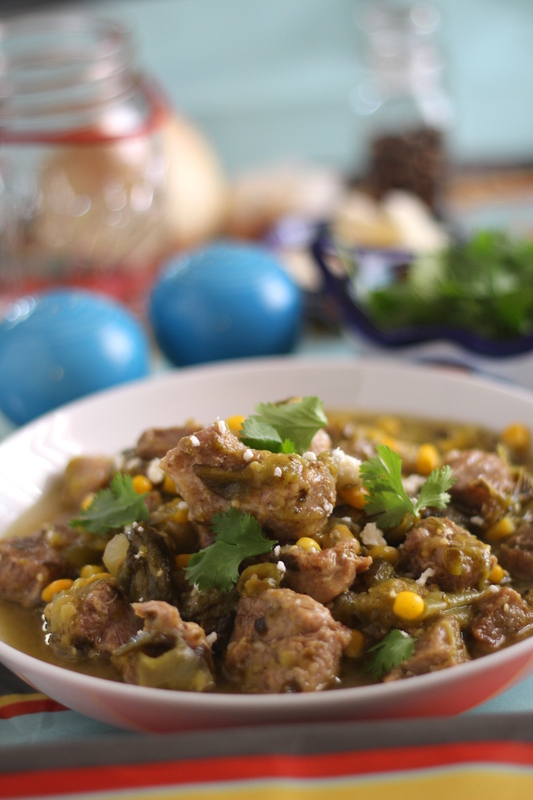 Next to the heat from the Serranos and the bright flavor of the tomatillos, the pork tastes wonderfully savory. 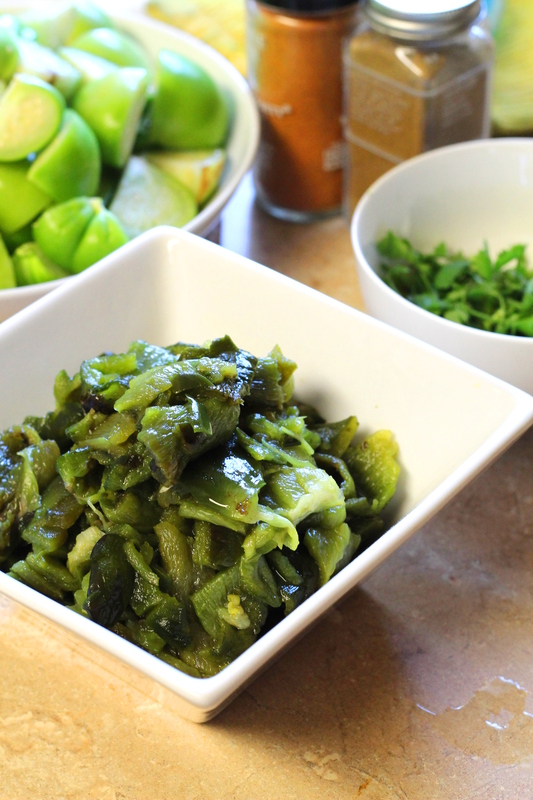 Start by roasting some poblano chilies under your broiler, then set them in a bowl to steam under a cloth for fifteen minutes. Next, get your pork, cilantro, garlic, salt, cumin, Serranos, green pepper, and onions into a Dutch Oven and into the oven to roast for one hour. …and chop them into quarters. Grab those poblanos out from under the dish cloth and peel them under running water. Remove the seeds, and chop. 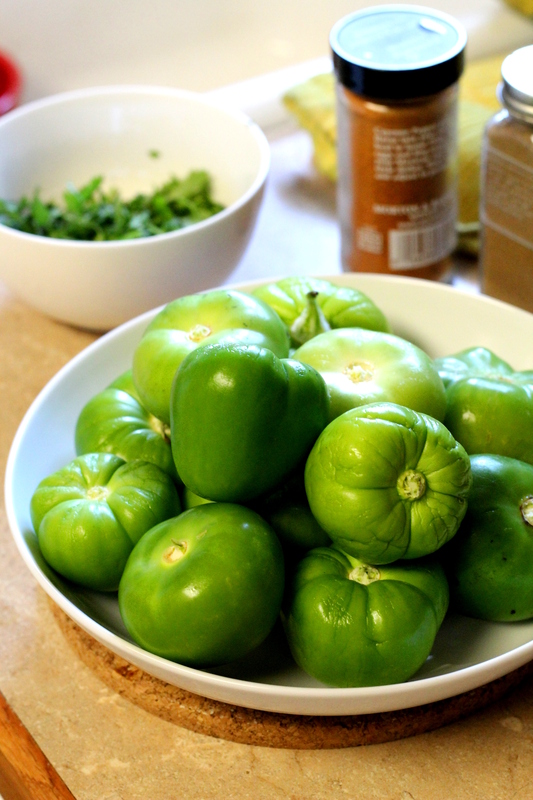 Add the tomatillos and poblanos to the pot and return it to the oven for another hour and a half. This would be a great time to work on some homemade tortillas! Add in the corn, stir, and taste. Add salt and black pepper as needed. Garnish with cilantro and cotija cheese. 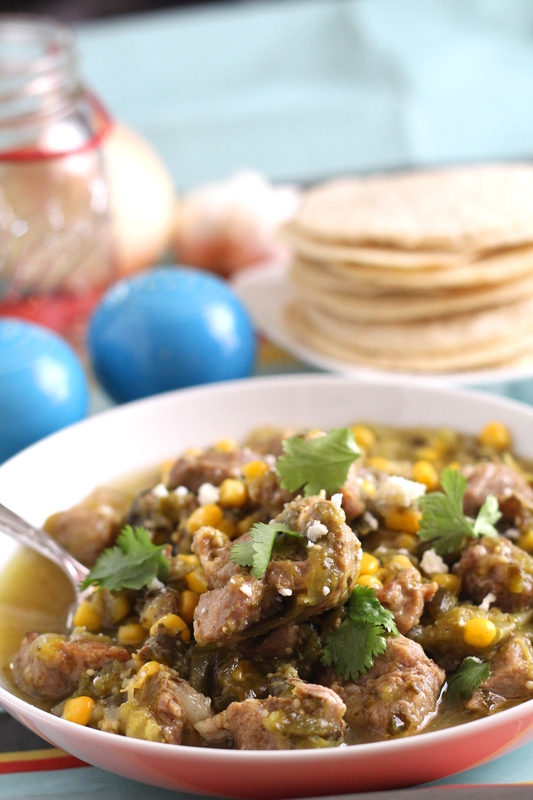 Serve with warm corn tortillas for dipping! Preheat your broiler to High and line a broiling pan with foil. Place the poblanos on the pan and broil close to the source of the heat, turning occasionally, until charred all over, about 10 minutes. 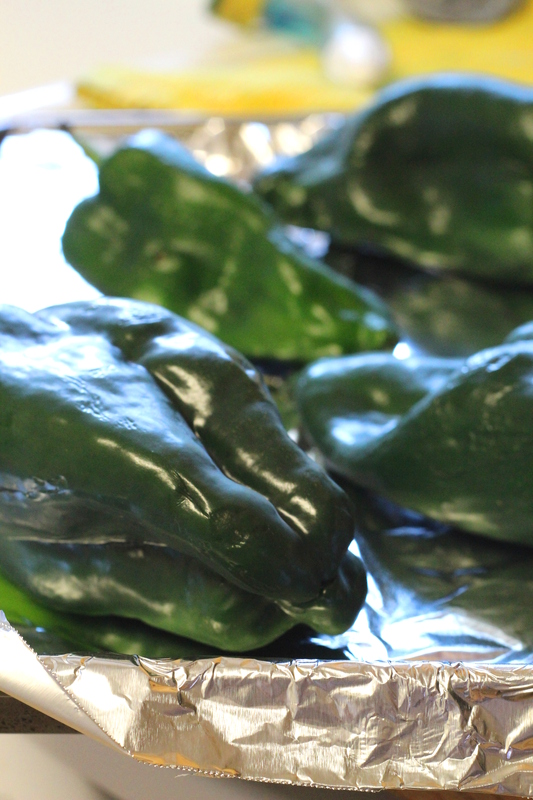 Wrap foil around poblanos and allow to steam until cook enough to handle. Turn oven to 325 degrees Fahrenheit. 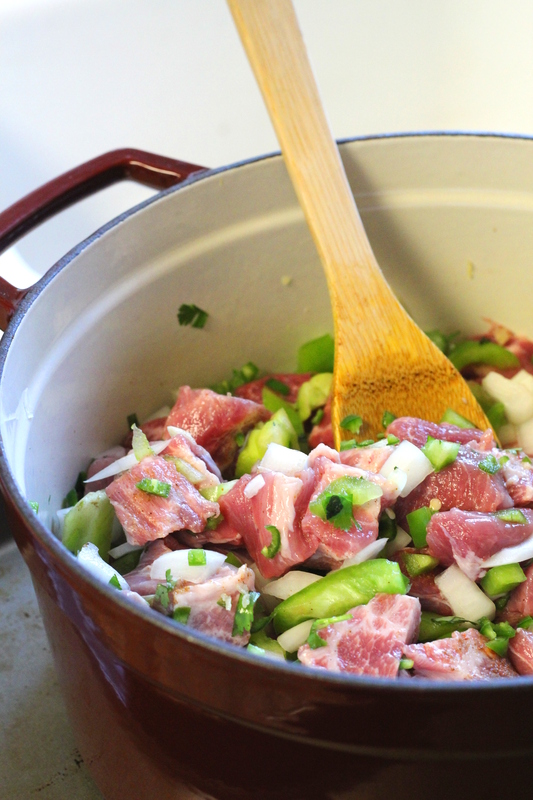 In a heavy 5-quart Dutch oven, combine garlic, salt, half of the chopped cilantro leaves, pork, green pepper, onions, serranos, cumin, and cayenne. Toss to combine. Cover and bake for 1 hour. 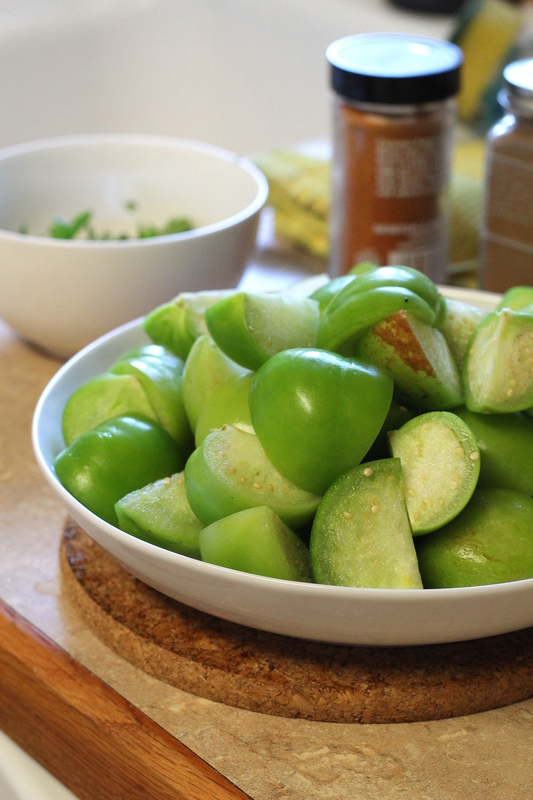 Meanwhile, remove and discard skin and seeds from the poblanos. Cut chilies into 1-inch pieces. 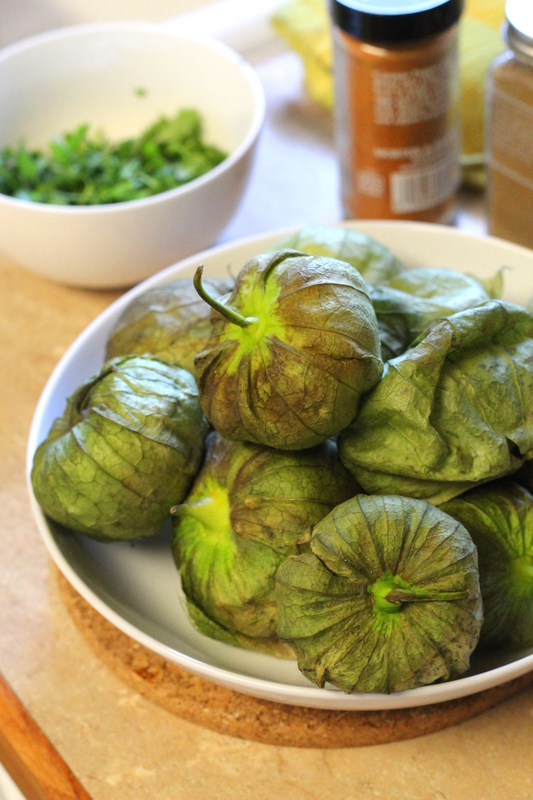 Stir tomatillos and roasted poblanos into the Dutch oven. Cover and bake 1 1/2- 2 hours longer, or until the meat is very tender. Stir in corn and heat through. Sprinkle with reserved cilantro and cotija cheese. Serve with tortillas. I make such a similar stew (from Food & Wine). It is cooked on the stove and doesn't have corn. We LOVE it!!! Yours looks great too! Delicious, love this stew! It looks wonderful. Excellent recipe! Super flavorful! Do you think it could be done in a crockpot? Low for 8 hours or high for 4?